If a tree falls in the wood can you turn it into a table? Turns out you can. That’s what Eli Arnow and Matt Rohrs do for a living they make furniture but the wood they use is strictly from fallen trees. Of course this means that after Hurricane Sandy, the woodworkers had more than enough raw material to use. The fitting name of their business is Epilogue Woods and what started out as a hobby has become a full time money making operation. “We have no real background,” said Arnow. “My father received all the tools a wood shop could possibly need from his dad’s uncle 30 years ago, and they’ve just been sitting in the basement, rusting, until about six months ago.” Arnow built his first fallen tree table over a winter break by following instructions on a YouTube DIY video. Arnow built a table once over winter break by relying on a YouTube video. Rohrs, a 25-year-old New Canaan native, said the last wood shop experience was in, well, wood shop class at New Canaan High. The pair taught themselves their craft mostly via the Internet. “Many YouTube videos later, we’ve made tables,” Arnow said. 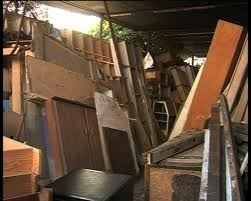 Since the big storm, Arnow estimates that they have an inventory of about 160 boards. It’s a way of making something good out of something bad. If you have a hankering to replace some of your furniture you might want to check out the Epilogue Woods catalog. Of course, this will mean getting rid of your old furniture and that’s where Junk King Capital District will make a huge difference. Junk King are the professional junk haulers who can make short work of taking whatever pieces of furniture you want out of your home and onto their truck. Whether it’s a sofa, bed frame, table, loveseat or mattress Junk King can haul it all away. Every Junk King crew is certified and insured. That’s just the kind of workers you want in your home. Whether you’ve got your furniture down in the basement or up in the attic, the JK crew will climb the stairs and do the removal. When they are done taking your furniture out of your house, you can put the Junk King Capital district crew to work clearing out your yard of any debris left over from the last storm. Junk King can help get your backyard ready for summer by carting off old planters, rusty patio furniture and even your grease grill. Why not call Junk King today and find out about their special pricing packages. You won’t be disappointed! This entry was posted in Junk King Capital District, Schenectady Furniture Disposal, Schenectady Junk Removal and tagged Schenectady Furniture Disposal, Schenectady Hauling on May 29, 2013 by Todd Porter. Last updated August 1, 2017 . If the children really are our future we’ll be in good hands with the kids from Schenectady High School. Recently a bunch of students banded together for an afterschool cleanup project that ended up stretching far beyond the boundaries of the school. Teresa Brown, a supervisor at Schenectady High School, told a local paper, “These cleanups had been done off and on in the past, but the administration hopes to make it a more regular occurrence for the students. I think they get a sense of pride in their school and in taking care of their school and community,” she said. This was another way to show the community that the high school can turn itself around. Too often the school has turned up on the state’s list of “persistently dangerous” schools but the kids, teachers and parents want to turn that around. The cleanup crews were made up of members of the Anime Club, Junior ROTC, Key Club, Student Ambassadors, Community Service Club and the Gay-Straight Alliance. Hopefully, these kids show that same “cleaning attitude” back at home. For generations, parents have been in a seemingly never-ending battle to get kids to clean up their rooms. Too often mom and dad throw their hands up in surrender and let the kid do what they want. They might not be the best approach because messy habits have a way of following us into adulthood. There are some kids who are put on a strict chore list of cleaning. Although there is always complaining, sooner or later they’ll discover that no amount of gripping is going to get them out of the work. Low and behold one day they actually get the cleaning done without being asked to do it a dozen times. Usually, that is quickly followed up with a request for money or use of the family car. But they earned it, right? There are some cleaning projects that neither you or your kids can handle and that’s when it’s time to call in Junk King Capital District. This would be removing all the bulky items that take at least two people to move. With Junk King you’ll get that two man moving crew and so much more. There is also a truck to fill up anyway you like. And count on prompt service at a very fair price. All Junk King Capital District wants from you is for you to tell them what you want thrown out. It can be in your yard, garage, basement or kitchen. Nothing is too big or too small for Junk King. Put them to the test today. This entry was posted in Schenectady Junk Removal and tagged Schenectady Junk Removal on May 15, 2013 by Todd Porter. Last updated August 1, 2017 .